The Manobo people, farmers, hunters and fierce warriors of northern and central Mindanao. 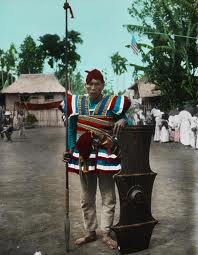 I tried to come up with a write up on my research on the Magahat, fierce manobo warriors very much similar in ways to the moro Juramentado who are prepared to kill and die for a cause. The Magahat way of getting things done is almost always through treachery. During world war II The guerrillas and civilan evacuees from the lowlands who crossed paths with the Magahat know too well not to turn their backs on this seemingly friendly highlanders. Instead I found this story by a Manobo princess worth retelling. this is a story as told by my Grandfather (Datu Perez of Lapaz, Agusan del Sur) to my Mama and to us, her children. a beautiful tale of our ancestry as who we are as people. a story of our tribe. Long before the coming of the Spaniards to Mindanao, Agusan Valley was then a vast woodland inhabited by several tribal groups of the Manobos. Different varieties of trees grew in these vast forests such as narra, yakal, bagras, and other big trees now extinct due to illegal logging and mining activities in the area. In the midst of these natural God given bounties is the big River called Agusan. There are many tributaries to this vast water system. From Compostela Valley, the Monkayo River, Wawa River from Bayugan, Simulao River from Loreto and Adgawan River from La Paz all meeting at Sabang Gibong in Talacogon. The water flows down to the great China Sea passing through the City of Butuan, then the kingdom of Batwan and on to Masao then the kingdom of Masawa. Closer to Monkayo lived the Taghimayat Tribe of the Manobo ancestry. These people according to the Minonas or village elders came from the kingdom of the Madjapahit and the Shri Vishaja Empire of Southeast Asia who reached Mindanao in search for economic hunting grounds crossing through land bridges. The vast woodland was inhabited by warring Manobo tribes each headed by a Datu whose functions were that of a Bagani, General of the Army, Chief of Warriors, a Baylan the village shaman, priest and medicine man who have direct access being medium with the gods and diwatas (good spirits) and busaos (evil spirits) and an Apo, a Manigaon (elder) who acts as the Chief Justice of the Supreme Court, the final Judge of all the cases that are to be settled in the village. The Datu therefore was the most powerful man, in his hands lies tripartite powers with no check and balance that of spiritual, military and power over the Justice system . While the women do all the household chores like cooking, washing clothes, cleaning the house, caring for small children, the men were busy looking for food, consisted of hunting wild boars and other edible animals and birds in the forests, protecting domicile economic areas such as marshlands commonly called “panganopanan” “ugpa-anan tu mga koonon” a swampy area where lots of food can be found, for it is the abode of mudfish (haluan), catfish (hito), eel (Kasili) and wild boars. In this place too can be found stumped of rotten trees, habitat of their favorite “abatod”- milk worms from dead trees- a very delicious delicacy, very highly proteinous eaten by Manobos of all ages- kids and adults alike. The tribe is protected by Baganis- warriors- almost all the men are baganis- they live and exist to protect the welfare of the tribe. Young teen age boys are baganis in red attire. They are the new recruits trained for battle. If a warrior has killed one enemy, he can decorate his shirt with a black band. The number of black bands decorated in his red shirt signifies the number of enemies he has killed. If in case in a battle with another tribe, one is able to hit with his spear a dead man in the house then he is entitled to wear a black shirt “naglinugom on” for he has speared and killed what the “busao” (evil spirit, spirit of death) already has killed. The ranks and seniority of responsibilities in the tribe is known by the number of black badges one wear over his red shirt. But the judge, the Apo, the elderly Minonas or Council of Elders usually wear white shirts with badges of black and red colors telling stories of his life , his family and tribe. The Datu however wore white shirt with different colors of badges over it. His conquest written in his shirt woven by some story teller of the village- red reflecting warfare and black reflecting death. That is why these tribal folks were disdained by other ethnic groups in Agusan like the Banwa-on recently termed Higa-onon found in Esperanza closer to the boundaries of southern Bukidnon, who claimed to be more peaceful people, more economically stable for they have learned to plant permanent crops like coconut and other fruit bearing trees. So, as the tale goes, in this upper portion of Agusan, the brave Taghimayats was ruled by Apo Todow, a shaman, a war general and Chief Justice of the village. (Babaylan, bagani and an Apo Manigaon.) His shirt was very colorful with backdrop of white and badges of red and black. He has a beautiful, charming, intelligent, obedient, industrious wife, Bae Sabuyakan Tisay. Tisay is as sweet as the red bush roses that grow along the ever powerful Agusan River in the Adgawan portion. The couple has two kids- a boy called Uto ay and a girl named Kamanduan. These two kids are the life and light of the village. They are the future leaders of Adgawan. Uto ay was around four summers old, Kamanduan, older by two summers.. Of course, there is no winter in Agusan, but they have rainy days, and much more heavier rainy days. Summer is always a welcome time when the sun is always up the whole day, passionately kissing over the vast woodlands. Uto-ay and Kamanduan played a lot, roaming freely around the village and they are well loved by the tribe. Bae Sabuyakan Tisay stayed in the house, being the first wife and the queen of the tribe. She is being tended to be the other four wives of Apo Todow, all relatives and two are sisters of Sabuyakan. Duway (plural marriage of one man and four women is an institution among Manobos , the fact that the tribe has more women than men. Men being early death casualties in constant warfare engaged in by the tribe.) The four other wives of Datu Todow serve in the palace as cooks, laundrywomen, housekeeper, care for the children, entertain guest and visitors if any and attend to the need of Datu Todow if the Queen is indisposed to do so. Other Baganis and men in the village practice duway as this is their customary law regarding marriage. A man must be responsible for the tending of at least five women in the tribe. So, every afternoon, when the sun is not anymore hot Uto-ay and Kamanduan go to the stump of a dead tree overlooking the river. From this stump, they took turns in jumping to the deep still river of the Agusan. This activity of the kids has become daily ritual for the entire summer months. All the nature surrounding Agusan including the favor of the Diwatas, the good spirits has known this activity and apparently approves together with the nodding of the heads of the little cicadas and crickets on top of the Durian and the marang trees and the different varieties of birds including the migratory birds from other countries hopping lazily from twig to branches of the trees in the vast woodland. Then, one day, the sun appears gloomy. Cloud formation seems to threaten the smile of the happy sun, foretelling that something foreboding unwanted event might happen… seemingly Uto ay and Kamanduan did not bother to care to notice the change in scenery around them for going to that stump of the tree during summer had been an addiction and a ritual for the two kids. Apparently, the day will not be complete without it. So, Uto ay was the first to dive. While Kamanduan waited for Uto ay to emerge out from the deep river. Then once Uto ay get out from the water, Kamanduan takes the turn to dive. This has been the process of the game. Then it was Kamanduan’s turn to dive, and she did. Uto ay waited for her to get out of the waters. Uto ay waited and waited..waited and waited.. the seconds turn to minutes.. the minutes to hours… Uto ay was already apprehensive.. What has happened to her sister? Why has she not got out of the waters till now? Has she drowned? Is she dead? Many questions play in Uto’s mind.. and there are no sure answers. But the sun was about to set and no Kamanduan has got out of the waters. The vicinities and surrounding areas starts to darken. Uto was already afraid.. running he went home… cringing with fear. What will father and mother do now? Where’s his sister? Bae Sabuyakan Tisay met Uto halfway down the road. Her colorful skirt bearing colors of red, black and white telling of stories of warfare and how the family had escaped and survived swayed reaching the ground as she ran toward Uto asking him questions of what had happened. What took them so long to return home and where is Kamanduan? Uto has a hard time opening his mouth and between sobs and falling tears with shaking body, he said that Duan dove from the stump of the tree, he waited for her to come out of the waters but that was the last time he saw her. She never got out of the waters again. The sun was halfway down the sky when Duan dove and now the sun has set and Duan never emerged again. Bae Sabuyakan Tisay run to where her husband was, together with the rest of the Apos and the Baganis and told them of Duan’s predicament. The whole village was in commotion. The gong was beaten informing the inhabitants that something bad has happened in their village. The manigaons and the minonas gathered together seeking wisdom from the diwatas and from each other as to what to do and how this issue be addressed. Then Apo Suday, a minona said: “ we will have to ask Datu Buada of the nearby village, to do the task for us- for among all datus, he is the only one with the power, the skill to swim to that deepest part of the river and stayed there for long and to know where and what happened to Duan.” So, emissaries were sent to Datu Buada telling him of the predicament of Duan and asking him if he could help , that whatever it is he will ask as payment for this gigantic task of finding Duan will be given to him with additional offers attached to the award . Datu Buada met Datu Todow with their men and conglomerated themselves near the stump of the tree where Duan dove. A ritual was made invoking the spirits of the crocodile of the river, from there Buada dive. Buada spent many hours under water . Many of the villagers were weeping , crying out loud, invoking the Diwatas for the safety of Kamanduan. The sound of the gongs and the drums continued till the wee hours in the morning. Nobody slept in the village except for the small kids and children. The men and women were in full alert, heart beating in anticipation as to what has happened to their little princess. It was about early morning that Buada came out of the river , in his arms lay the limp but alive body of Kamanduan. The people shouted with joy! It was a great day for every body! How the people rejoiced. They praised Datu Buada for a feat unsurpassed, that is bringing the life back of their beautiful little princess. The gongs and drums beat now joyfully announcing to one and all that the princess is found and there is a reason for great rejoicing in the village!!! The Manigaons, minonas, baganis of the two tribes gathered around Datu Buada ready to listen to what transpired under water. Datu Buada was given buyot (bettle nut for chewing put in between his right teeth protruding in the lower lip), started to narrate his escapade under water. Under the influence of the Buada Spirit (spirit of the crocodile god) the Datu narrated the event in a form of a chant (tud-om): “Oh… oh… oh… down under , I saw Kamanduan in the lap of a very big lumod (mermaid of the river, the spirit of the river Agusan). The lumod was singing lullaby to the princess for her to go to sleep. Soon Kamanduan fell asleep, but it took a long time for the lumod to fall asleep. She was watching Kamanduan carefully it was about dawn when the lumod fall asleep. I , Buada hid in the under water bushes, when I saw that the Lumod had fallen asleep. I immediately swam silently towards where Kamanduan was, carefully I snatched her from the lap of the lumod who was soundly snoring, and brought her up towards the surface of the waters limp but very much alive…” The village men started chanting thanks to the good diwatas of the river agusan and the woodlands.. Datu Todow asked Datu Buada what will be the prize for such conquest , twenty boars, twenty chicken, twenty sacks of gabi (taro). twenty women slaves.. what will satisfy Buada? Datu Buada shook his majestic head and said: “ I don’t want any of what you offer me. All I want is that when Kamanduan reaches womanhood indicated by menarche I want that she be wedded to my son Sundi.” Datu Todow just like any gentleman sealed the pact of agreement with Datu Buada, giving honor to his word that whatever be the prize that Buadawould like to get after he is able to save Kamanduan will be granted to him. So the pact was sealed. In due time Kamanduan was to marry Prince Sundi of the Buada Tribe. The ritual for betrothal was performed offering the lives of the two children to the Diwatas that in appropriate time they will become man and woman and the Tribes of the Taghimayat and the Buadas will be one. After that heart palpitating incident, time and seasons became normal once again for the Manobos of Agusan. Uto now growing to manhood, and soon being recruited to the baganiship. Young Kamanduan however, every night is being visited by the lumod, the god of the river agusan telling her to go back to the stump of the tree for in it is an oil which she has to use everyday for her hair and for her skin. At first Kamanduan was very apprehensive, but she cannot anymore contain the instructions of the lumod but to comply for it appeared nightly in her nightmarish dreams. Kamanduan found a jar of oil at the foot of the stump. Princess Kamanduan then was the most beautiful girl found in the Manoboland that time. Many men were enthralled by her and would like to pursue her with ardor. But alas, her fate had been sealed for in proper time she would be wedded to Sundi the only son of Datu Buada. He stomped his feet in a savaged outrage. Todow should not allow this to happen. What has happened to the contract made the time Kamanduan was saved by Buada under water that she was to marry Prince Sundi. So, the Buadas planned a magahat against the tribe of Todow. The order was to kill all of Todow’s people. But like all Manobos that time, all children are betrothed but parents left alone their children most of the time and very little parental concern is being given to their kids. Todow was the last person to know of Kamanduan’s affair, but too late… No amicable settlement could be made for in the baganis law.. any injustices committed by any Manobo should always be punished with death. So, the warfare started, killings were made in the name of the tribe, Buada killing Todow’s men. Todow’s men killing Buada’s people.. men, women, children, not sparing any one including their animals. 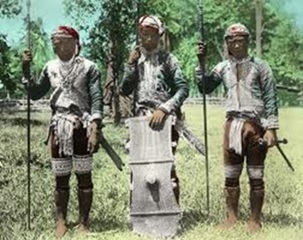 Agusan was in bad shape, Even those belonging to other tribes cannot contain the warfare. Todow decided to put Kamanduan into auction.. Duan was put into public bidding, but no man will take her now. She was considered accursed… Buada will not take her for the Buadas believed that only her death can pay the honor and dignity of the tribe besmirched by her reputation of falling in love with another man and not to his betrothed. Many in Agusan so tired of the warfare moved out of the vast Agusan Valley. Those who reached Lake Lanao became the Maranaws. Those who reached Cotabato became the Maguindanaos, others went to Butuan and became the Lapaknons. There were those who went to far Davao and became the Bagobo.